A malaria vaccine that uses a weakened form of the parasite has passed a "critical milestone" in human safety trials, say researchers. 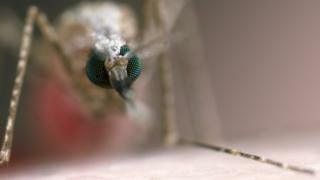 Doctors used a genetically modified form of malaria that was unable to cause a full infection in people. Trials, published in the journal Science Translational Medicine, suggested it was safe and generated a good immune response. Tropical disease experts described the findings as "promising". The malaria parasite goes through multiple stages both in mosquitoes and inside the human body. The team at the Centre for Infectious Disease Research, in Seattle, deleted three genes from the parasite so it could not infect liver cells. The idea is that "infecting" people with the weakened parasite will expose the immune system to malaria, but the parasite will not be able to complete its lifecycle to cause disease. Ten people took part in the safety trials. No-one went on to develop the disease and there were no severe side-effects to the treatment. The patients' antibodies were then given to mice, which showed greater immunity when they were deliberately infected with malaria. Dr Sebastian Mikolajczak, one of the researchers, said: "The clinical study now shows that the vaccine is completely attenuated in humans and also shows that even after only a single administration, it elicits a robust immune response against the malaria parasite. "Together these findings are critical milestones for malaria vaccine development." There are two similar approaches to "attenuating" the malaria parasite - one involves weakening it by exposing it to radiation and the other gives the patient anti-malarial drugs at the same time as infecting them. But the most advanced malaria vaccine is years ahead. RTS,S uses some components from the parasite to generate an immune response and the vaccine is now going through large field trials. However, an approach that uses the whole parasite may ultimately prove more effective. Sir Brian Greenwood, from the London School of Hygiene and Tropical Medicine, told the BBC News website: "It is encouraging, but this is a first step toward developing a vaccine. "It is really promising and the evidence presented here is enough for challenge studies [in which people are immunised and then infected with malaria to see if it works]." However, he cautioned that the latest approach is "not practical in the field" as it requires nearly 200 bites by infected mosquitoes. Ultimately it would have to be just an injection. Dr Robert Seder, from the Vaccine Research Centre at the National Institutes of Health, said: "This report is a major advance in malaria vaccine development by providing the first evidence that genetically attenuated Plasmodium falciparum parasites are safe and immunogenic in humans. "Future studies demonstrating protective efficacy will be the next critical milestone for continued development of this promising vaccine approach".